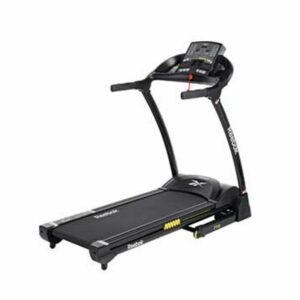 This Reebok One treadmill is the must-have for any fitness fanatic and there is no compromise on features. It offers the perfect way to get fit from the comfort of your home. The LED console display has all the expected user feedback functions including speed, time, distance, calories, pulse and incline. 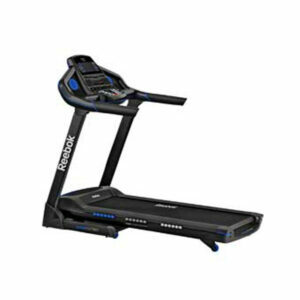 It features a multi-speed and incline setting along with a range of pre-set programs to choose from and allows you to create your own manually. You can enhance your workout with the built-in pulse sensor to track your heart rate or run to the beat with the integrated MP3 input and speakers, which allow you to listen to all of your favourite tunes while you are completing one of the many pre-set programmes. The running area of 130cm by 43cm provides ample space for long distance runs and is further enhanced by the running decks soft cushioning system, designed to deliver a smooth, comfortable running experience. 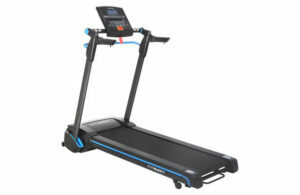 The built-in transport wheels allow you to move the treadmill around easily and efficiently. MP3 connectivity with built-in speakers. 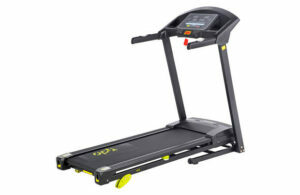 Running surface size L130, W43cm. Programmes include: 12 preset, 3 target, BMI.